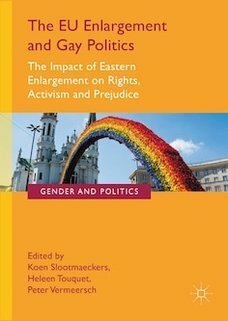 This book offers a well-investigated and accessible picture of the current situation around the politics of LGBT (Lesbian, Gay, Bisexual, and Transgender) rights and activism in Central Europe and the Western Balkans in the context of the enlargement of the European Union (EU). It provides not only thoughtful reflections on the topic but also a wealth of new empirical findings — arising from legal and policy analysis, large-scale sociological investigations and country case studies. Theoretical concepts come from institutional analysis, the study of social movements, law, and Europeanisation literature. The authors discuss emerging Europe-wide activism for LGBT rights and analyze issues such as the tendency of nationalist movements to turn ‘sexual others’ into ‘national others,’ the actions and rhetoric of church actors as powerful counter-mobilizers against LGBT rights, and the role of the domestic state on the receiving end of EU pressure in the field of fundamental rights. Buy "The EU Enlargement and Gay Politics"